Six years into a massive disruption of the newspaper business, most U.S. newspaper companies are driving hard toward solutions they hope will stop the revenue slide and stabilize the business. They are focused mainly on two things: driving costs down and driving digital sales up. With revenues down by half since 2005, painful cost reductions have been keeping most newspaper companies alive and in the black. At the same time, some companies have achieved encouraging gains in digital revenue. But few have managed to fully offset their print declines, even in the most recent reporting periods. So the business keeps shrinking. Fewer people, fewer resources, more consolidations, more outsourcing, more partnerships, redoubled digital sales efforts … most newspaper executives probably believe they are rethinking everything. But few are rethinking the assumption that news can be the heart of a successful local media model. Mostly, they’re just trying to produce as much news as they can with fewer people, distributing it on more digital platforms and selling more ads around it. They don’t seem to question whether news can generate the audiences and revenues they need to stay in business. Here’s the brutal fact: News isn’t getting it done. The disruption we’re suffering is not just about the distribution model — print vs. desktop computers vs. mobile devices. It’s a disruption of the news-centered business model. In the era of infinite media, news can’t deliver large enough audiences nor attract enough adjacency advertising to sustain the business. The industry keeps reassuring itself by saying that everybody still needs news. The mantra goes like this: “Nobody else generates the expensive, unique, high-quality local coverage we do – city council politics, school news, high school football, crime, in-depth reporting….” and so on. True. But in the era of infinite information, how much does the average person really need and want this reporting? Not as much as we think. How many of them will come to us to get it, how often, and spending how much time? Are news audiences in the digital age large enough and engaged enough to give advertisers the reach and penetration they need in their markets? Now that people have unlimited information access and bandwidth, they are spending much more time on personally relevant information than on local news. Facebook is now the No. 1 web destination in U.S. markets, typically drawing about 10 percent of all website visits by local market residents. Newspaper websites now typically rank around #15 or so in most markets, drawing less than 1 percent of all local visits. Compare Facebook’s user stats to any newspaper. At Facebook, on average, users spend more than 15 hours a month on the site, visit 40 times a month, spend 23 minutes per visit and create 90 pieces of content. At newspaper sites, on average — varying only somewhat by market — visitors spend much less than an hour a month, visit an average of roughly four times and spend about three minutes per visit. And they generally create no content at all. The conclusion staring us in the face is that, given infinite information, the average person will spend far more time on personally relevant and interpersonal information than on generic, “fits-all” information like news. The top 20 sites in a typical Morris market, ranked by number of visits from local users. 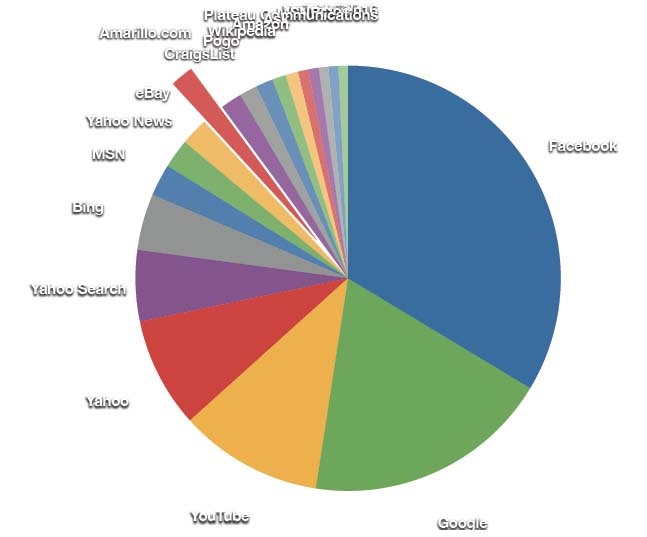 Facebook has more than 20 times as many visits by people in the market. It’s not surprising, then, that newspaper websites are also outranked among local users, with only rare exceptions, by Google, Yahoo, YouTube, assorted email sites, Craigslist, eBay, Wikipedia, personal banking sites and others. In this new age of infinite digital bandwidth, news isn’t enough to attract the audiences that advertisers need. With the number of page views local news generates, we can’t sell enough banner ads at high enough rates to continue the business on the scale we have enjoyed in print. Meanwhile, the print audiences – artifacts of the “mass media” era now ending – are declining in most markets at 5 to 10 percent a year. Price increases only accelerate the trend. This will continue for the foreseeable future as the population migrates inexorably from print to digital. The industry rightly cherishes the social good it does by reporting the news, but as revenues keep shrinking, we simply must find other ways to augment them. If we don’t, we will keep shrinking indefinitely. We need to bridge quickly to new models that can succeed and grow in the new era of infinite bandwidth. But what models? We need two kinds — sales/revenue models and audience models. For audience, the news model is breaking down. In the mass media era, when it cost a fortune to send information to the masses, news mattered to everybody and, therefore, was important enough to send through the tiny, costly pipe of print and broadcast. By definition, news was one-size-fits-all. Most newsrooms are still defining it that way. But now that the information pipe has gone infinite, anybody can send anything through it. And, given these infinite information choices, a human will choose the information that matters most to her — what she likes best, is most interested in, is most directly relevant to her current needs and wants. On that score, Facebook is a huge lesson for the newspaper industry. Generating no content itself — simply giving people ways to exchange their own content — it has become the biggest single space on the Internet and the largest carrier of display advertising. And it has grown local audiences more than 20 times the size of our news audiences. Local media colleagues, take note — Facebook is more than just a place where you can tease your stories and bring some traffic back to your site. It’s also living proof that generic information like news is being swamped and engulfed in massive amounts of interpersonal information. Remember when we did nothing while Craigslist sucked up our classified advertising business? Now we’re doing nothing while Facebook usurps our “local information” business. That’s the next model beyond news — local information. The good news is, even in the Infinite Media Era, people still live in communities. They still get up every morning with things they need to do in the local space, places they need to go, things they need to buy or sell, interests they want to satisfy, problems they need to solve. So they still need local information — far more, in fact, than they need news, which now seems to be everywhere. They want the kinds of personally relevant local information that will help them get things done in their lives. So it’s time for a fundamental awakening in local media businesses. We need to stop thinking of our communities as places where news happens and we report it. We need to start thinking of our communities as places where people lead their lives and we help them do it. We need to figure how to provide solutions they will regard as essential in their own lives and will use over and over every day. News has its place in this, but it’s a far bigger assignment than news. I preached this in Newspaper Next’s 2.0 report, and the situation hasn’t changed. There are huge opportunities in local information, if only we can remove the narrow and outdated filters of “news” that still linger from the dying Mass Media Era. This will require new paradigms for both information and information-gathering. For example, right here in our communities, the social media are alive with local information, ranging from the banal and useless to the fascinating and essential. They are not just places to leverage traffic to news stories — they are fast-moving networks of information that we should be mining for content of value to redistribute in our communities. The phenomenon of social sharing is now so ubiquitous that we should be building our own local networks where people can share what matters most to them about what they are doing or would like to do in our communities. As local media companies, we need to be all about community — about the place where you live. Fortunately for us, Facebook is not, and nobody else has arrived yet with great local platforms that enable people in communities to connect and share and get the kind of information their lives demand every day. Neither have we, and we must. And fast. We’re losing the audience race in our markets, and every day counts. Posted on April 29, 2012, in Disruption, The basics. Bookmark the permalink. 14 Comments.